Cognitive Impairment in the Elderly"
Cognitive impairment is increasingly prevalent in our aging society. Impaired cognitive capacity can be the consequence of age-associated primary brain disorders (depression, Alzheimer’s dementia (AD), cerebrovascular disease etc.) and/or secondary brain disorders due to medical conditions such as diabetes, inflammation or treatment interventions and life style factors. Postoperative Cognitive Impairment is a disorder of cognitive function following surgery. This condition often has an acute phase of Postoperative Delirium (POD) which then may be followed by a more chronic phase of Postoperative Cognitive Dysfunction (POCD), which tends to persist over time. However, POCD might also occur without detected POD. The incidence of POD ranges from 10 to 45%  and of POCD from 10 to 25 % [2,3] Increased age, as well as a range of medical conditions, may predispose patients to POD/POCD. 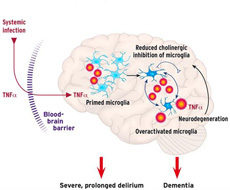 BioCog, a FP7 funded project, will establish valid biomarkers panels for risk and clinical outcome prediction of POD/POCD (Postoperative Delirium/Postoperative Cognitive Dysfunction). The study population will be 1200 patients, aged 65 to 80 undergoing major elective surgery. 1) to support clinical decision-making in patient care, e.g. to balance the individual POD/POCD risk against the expected overall clinical outcome of a surgical intervention. 2) to allow the design of more sophisticated and hypothesis-driven clinical studies and drug trials (translational research) in the future. Multiple risk factors are associated with POD/POCD. Research aiming to understand the diverse pathomechanisms of POD/POCD requires identification of a range of clinically valid biomarkers. Description of some of these is limited at present. Integration of neuroimaging biomarkers, which provide direct information on brain structure/function with high sensitivity, combined with complementary knowledge on specific pathomechanisms from molecular biomarkers (cholinergic, inflammatory, metabolic) as obtained from body fluids (plasma, cerebrospinal fluid (CSF)) is expected to allow accurate patient stratification (subtyping). This complex and multidisciplinary approach is the basis of BioCog. The socioeconomic implications of postoperative cognitive impairments, especially in an aging society such as the European Union, have a profound societal impact. POD/POCD are associated with increased morbidity and mortality, associated longer and more costly hospital treatment as well as subsequent higher dependency on social support needs. Developing and providing biomarker solutions to clinicians, academia and biopharmaceutical industry is now one of the most rapidly expanding economic sectors in Europe and abroad. The European Medicines Agency (EMA) expects that the use of biomarkers in research will contribute to faster public access to new medicines and improved clinical disease management as traditional clinical outcome-based drug development (with comparatively little use of biomarkers) can be a long, expensive and uncertain process. A state-of-the art clinical database and bio-bank, the first of its kind in the world, will be created within BioCog. The new bio-bank will become an integral part of the European Biobanking and Biomolecular Resources Research Infrastructure (BBMRI). This will allow many specific and hypothesis-driven research questions to be addressed. European-wide cooperation between academia and SMEs in this project will facilitate dissemination of BioCog project output. BioCog will create significant potential for exploitation. Possible customers are: 1) physicians and hospital departments being involved in pre-surgical decision making, 2) pharmaceutical industry intending to conduct biomarker-based drug trials in POD/POCD.